Note: this requires the Battle Merchants base game to play! Battle Merchants is an economic strategy game in a fantasy world where the players are arms merchants selling weapons to all sides of the same war. Who wins the war doesn't matter; the richest player at the end of the game wins! New Kingdoms is an expansion to Battle Merchants. It is a new set of Kingdom Cards that completely replaces the base Kingdom Cards. 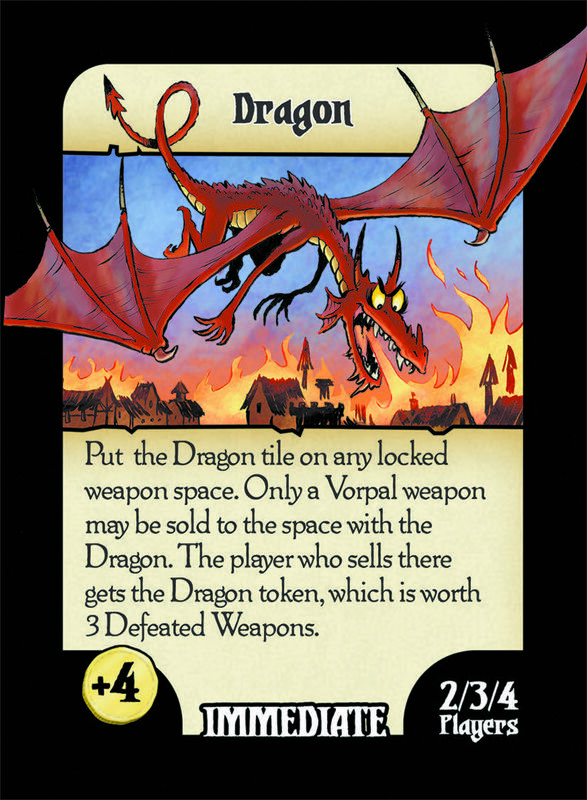 These cards contain all sorts of interesting characters, like Dragons, Bards, Sorcerors, Kobolds, Necromancers, and two halves of a Broken Ring, that present players with new and interesting challenges. There are also updated versions of current cards, a handy Craft Tracker to easily keep track of everyoen's Craft levels, and a couple of new rules. Check out more reviews and information at battlemerchantsgame.com! You can buy a print-and-play version of the game here. We have enjoyed our first play of the base game PnP. Now I have printed out these files and I have a question and a suggestion. First why is the new Craft Tracker chopped up into 4 pieces to put back together? Second, it would be nice if there was some little mark on the cards to show that these are from the expansion to tell them apart and be able to separate them from the base game if you mix them. I see now that the Craft Tracker is only out of order on one side.. I still don't understand why but that is not a problem..